I wish you all the best this holiday season and for the new year. I planned to have this radio blog posted yesterday but life has a way of changing your plans. My Christmas was very quiet this year. I slept, watched tv, and listened to music. Each year, the holiday season gets busier and busier for me between the singing, music concerts, baking, baking, and shopping for presents (all of which I enjoy!!!) so I enjoy peace and quiet on Christmas Day. I hope that does not make me sound like too much of a Scrooge. 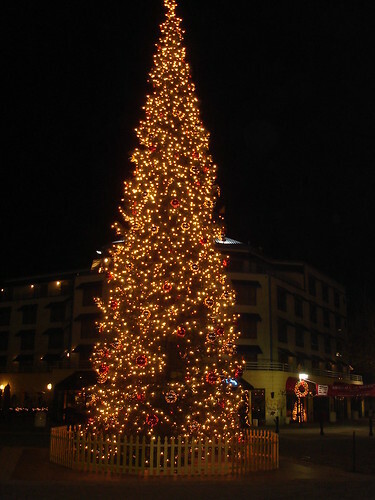 The above photo is this year’s Christmas tree in Jack London Square in Oakland. The music selected this week ranges from 1959 to 2005. I will come back later and tell you all about the music. In the meantime, enjoy! This entry was posted on Monday, December 26th, 2005 at 10:56 am. It is filed under Radio.Blog. You can follow any responses to this entry through the RSS 2.0 feed. Nice. Am spending time w/sis & Mom. Have had a cold, too. Ick. But did some web-browsing today to keep up and saw this mention of Lizz Wright and thought you’d be interested. Great list. Esp. since I rarely come across jazz versions of songs for the holidays.